So you’ve been shooting for awhile and would love to see your stuff on the wall. Maybe you’ve been selling your work digitally because you don’t know where to get started with making prints. There are a lot of places to learn all about the benefits of various color spaces. It’s a very important concept. The best thing is to find out from your printing company which they prefer to get. All the amateur and most the pro shops prefer you export in sRGB. Adobe RGB is a bit bigger a color space and should give a small improvement in the quality of the final print. I shoot in RAW so this color space is determined on export from Aperture, Lightroom or Photoshop. As a general rule of thumb it’s best to keep the color space as large as possible for as long as possible. Here’s a paid link to a great product for this. It works great with their Color Checker Passport when you shoot. If it’s not worth it to you to profile at least try to work in a constant background lit room and make sure your monitor is about at the mid brightness value. With any modern camera you should have plenty of pixels for any size print you want as long as you recorded at the largest size and didn’t overly crop. A good thumb rule for a larger print is 100ppi. I personally give my printing company 300ppi. I’m a pixel peeper though and love to get in real close to a print. Most people aren’t like that, 100 ppi should be fine. It’s simple math. Find the information about the shot and see how many pixels tall and wide it is. My 18 Megapixel (means 18 million pixels) camera makes 5600 by 3500. That means I could make a 56in by 35 in print!!! The biggest mistake people make is just not watching it. They will choose the “quickest upload” feature on Snapfish and wonder why their crisp sharp pictures printed so badly. Always know how many pixels the print shop has. Here’s a great application for that. BorderFX it works with Aperture and iPhoto. (Anyone who knows of other photo management plugins please let me know) when you create the presets in here make one called 11×14 and set it to be 300ppi. Then every export using this is tremendously faster then given your print shop the biggest file. When you put a 8×10 into a frame the frame can’t have an 8×10 opening. If it did it would be impossible to have sit inside without slipping into the crevice with the glass. So all frames (and matts) take away 1/2 total, 1/4 in from each side. The issue is if you’ve cropped your picture just right and printed a 8×10 right to the edge then you will have to make another cropping decision when you put the print into the matt or frame. That is unless you know that is going to happen and make a .2in white border on the outside of your print. That way your vision is maintained to hand the final product as close to the what you saw on screen. The extra bit of fudge factor is there to save your sanity when trying to not let white show as your fix the print to to matt or frame. BorderFX comes into the rescue again. You could add this .2 in in photoshop if you want. I just add it to each preset I make. Just make a white border with a width of .2 in on each side. It comes out perfect. You’ll have every bit of the picture in the final product from the top to the bottom. Most people think of watermarking as a way to prevent theft. With photoshop and enough time I bet i could defeat most any watermark. I look at it as a way for people to have a future connection to the artist. It’s the same as Van Gough painting in his name. That’s exactly what I try to make my watermarks look like. You have to look for them to see them. They don’t distract. BorderFX has a water mark feature. Just add it to each preset. Place it in the bottom right corner. Find a font that looks like your brand has been hand written in. Make the opacity about 75%. Make a preset for each size print that includes 300ppi, .2 in border, and the watermark. This makes it so much easy when sorting these files layer o. Your computer and especially when they are in the print shop’s que and you are deciding what prints to make. Get all your post processing done in iPhoto or Aperture and choose export-BorderFX. Crop before or after export. Choose preset for your print size. If you haven’t chooses the cropping do that now. Go to watermark and make sure the placement isn’t distracting. If its too hard to see change the opacity or switch between black and white. If you are going to eventually go brought a lot offers the best company out there is Goldenstateart. heres why; their matt’s look beautiful, you get to customize each order for what colors you want, they are US based, they are the least expensive, their staff responds to emails right away, if you order in quantities they choose the shipping is free, product arrives in damaged very quickly. 100 4×6 with back boards and sleeves. You may be trained to scoff at the print shops that cater to the point and shoot audience. I’ve gotten large prints from shutterfly and compared them to more professional print shops and could barely tell the difference. 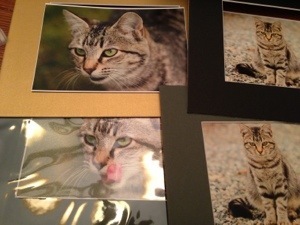 The reason I say they are great for 4×6’s is because I like a better print shop that charges less at the 8×10 range. Another rhing to watch for is there sales. My wife is renown for getting hundreds of 4×6’s from them by only paying shipping. They have a color correcting team on staff with monitors color corrected to their printers. They get your order in their que and make the prints. They walk over to the printer, pick up the print and compare if to their monitor to make sure it came out just right. This is a free option. So if your monitor isn’t color corrected to your printer this is a great option. I’ve gotten hundreds of prints from them and never once had any funny business. ← Premiere Pro Retina Support!?! ?